I am in a high state of agitation as I write this, because unless she is able to take off a year to work and then return to school with the same scholarship status, our daughter will have to leave a Catholic institution of higher learning after a straight-A freshman year. It was a calculated risk, true. We read the Cardinal Newman Society Guide (I ripped it apart tonight; it is of little use to us now), and encouraged our older two children to apply to the colleges listed, as well as other state and private institutions. Both wisely decided to stay in our state, to save money on travel (and they love their baby brother!). Our oldest decided to accept a generous scholarship at a non-Catholic college; our second could find her desired field in many state schools, but in only one of the local Catholic colleges was it even somewhat affordable. After prayer and calculation of the variables, she decided on the Catholic one, and had a very good year. Unfortunately, the variables changed just enough that her debt load upon graduation would have been well over $60,000. Sure, we could help more. I could go to work and put our younger children in school (although not our local parish school at almost $6000/yr per child). We could take out a private loan and put our family in debt beyond our mortgage to help cover this year, and hope that she would become an RA next year—one of those darn variables again—but there is no guarantee of the RA position and we are frankly not going to put our family in that financial position. We will not stop homeschooling for this. At this point, we are shouting, “Chicken!” We blink! We lose! She is very disappointed, and I am—well, I am torqued. Staying at home, large family, tithing, homeschooling, the sacrifice of Catholic high school, carpooling—I am here to tell you that these advantages plus reading the Newman Society Guide from cover to cover will not guarantee your child a chance of coming out of a faithful Catholic college to marry and start a family or pursue a religious vocation or the priesthood without a prohibitive debt load. Okay, I admit, I am whining. I understand that life isn’t fair, and we are not entitled to anything. However, I am appalled on our children’s behalf. Jobs were plentiful in the mid to late ‘80’s, and I could easily pay for a large chunk of the room and board for my (non-Newman Guide) Catholic university. I think it was $4000 a year. Stunning. Our family has learned our lesson: It is admirable to apply to faithful Catholic schools, but if the debt load will be triple or even quadruple the state school’s — why encourage them to impede their life with such a burden? Better to attempt to equip them to love the Lord and the Church in all circumstances with no expectation that they will attend a school which will in any way support their efforts. Finally, I have a convoluted thought — but let me know if it makes any sense, please. In the Middle Ages, or even fifty years ago, a fine Catholic university education was usually for either the very wealthy or the brilliant. An acceptable inequity! The rest of the Church militant did not strictly have that “need:” they had apprenticeships, farms, other employment, or the important vocation of raising a family or the religious life or priesthood; most had a “proper” place in the world. No earthly situation is “perfect,” but there was a certain “security” in one’s identity and societal relationships. Now we have a twist: Catholic Higher Education is again affordable, really, only to the wealthy and the brilliant. However: the rest of us Church Militants are up in arms! 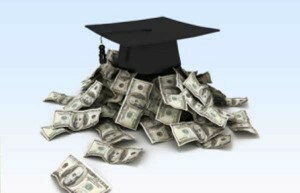 A college degree is now “necessary” for most employment, especially if one wishes to earn a “living wage” so that the spouse can stay home and actually raise the children. Therefore, most young Catholics slog through the political correctness of state institutions, and many lose their faith in the process. The farms are few, apprenticeships are bestowed by unions or the state, and many young adults do not commit to marriage until older, resulting in not so many children, and vocations are buried under student loan obligations. Security? Heh — maybe at Chicago’s O’Hare, but certainly not in sure self-identity and satisfying societal relations! Perhaps by the time our little guy is eighteen (sixteen years! ), the higher education bubble — for ALL institutions of higher education — will have burst. Maybe we won’t really care, anyway. Perhaps we’ll own a farm and he will know how to cultivate and shrewdly market rare types of salad greens and fix his own electricity and plumbing. Maybe our daughter will have opened her own music school. One activity we don’t foresee is donating to our children’s Catholic alma maters.